In a market with a lot of generic products and little diversity, the Char-Griller 16620 Akorn Kamado Kooker Charcoal Barbecue Grill and Smoker, is something refreshing and different. It’s a blast from the past and is supposed to make food taste as it came out of a clay oven. There’s no disputing the quality of clay ovens, which make great food because of the insulation provided by the clay, and to achieve this feat, Akorn Kamado has created cutting edge technology. Kamado has produced new ceramics that insulate and perform, according to the user manual, exactly as clay would. If this were true, it would be an excellent and most welcome entry into the market, so I was interested to see if the new technology worked. Contained in this Char-Griller 16620 Review is an account of what I found out. The Char-Griller 16620 has measurements of 24.8 inches length, by 28.7 inches of width and is 21.6 inches high, at a weight of 98 pounds. 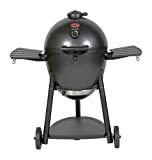 This is standard size, and though the weight is above average for outdoor grills, they’ve added to the design some excellent wheels, so buyers won’t have to pick it up, and they lock into place for a sturdy cooking experience. While the overall look of the Char-Griller 16620 isn’t hugely aesthetically pleasing (it actually looks like a giant stone age stew pot), it’s made out of high-grade 22 gauge steel, so the Char-Griller will last for many years without rust. It may not be an oil painting, but it has a quick assembly and a large surface to cook on. The cooking surface is 306 square inches and it also has a warming rack, that is a massive 165 square inches, so the number of food buyers are going to be able to cook will be immense. It simulates the experience of clay oven cooking by using thick solid steel on the outside to provide insulation, while coating the inside of the bowl with improved ceramics, from the ceramics used in traditional Kamado cooking. They then fitted dampers to regulate air-flow, in the same way, a clay oven would. This methodology saves on charcoal; I needed very little compared to other grills and I have to say, I was impressed with the end result. The ribs I cooked, and my steaks genuinely tasted as they came out of a clay oven, so it worked well. While you get that amazing clay oven warm, moist taste, the Char-Griller does take some getting used to. The idea is that buyers should adjust the dampers, depending on what they’re cooking, for best results. For smoking, a heat of 200-225 Fahrenheit is needed, so the top damper should be closed and the bottom damper should be 3/4 closed. For chicken, burgers, or ribs, both dampers should be 3/4 closed. Meanwhile, for searing steaks, both dampers should be practically open. For buyers not used to operating a Kamado grill, there may be a small learning period involved in owning this. That said, what buyers get here is an entirely different, traditional clay cooking experience that tastes great. As indicated above, the Kamado Kooker is extremely versatile. Grilling or smoking, anything from sausages to whole chickens, pizza, burgers, steaks, vegetables or ribs. It has helpful features like a folding side shelf, locking lid and a warming rack that be easily removed. The ash pan can be dumped for easier cleaning too. The Char-Griller 16620 Akorn has some nice features, but people won’t be buying it for those. It also has a large cooking surface, but so do a lot of grills. The Char-Griller 16620 claimed to offer a unique clay oven experience, and it is buyers who crave this kind of cooking who will be drawn in, and I’m happy to inform those buyers that for clay cooking, the Char-Griller 16620 is second to none. Terrific results and any time buyers spend working out exactly how far to close, or open the dampers, will be rewarded back to them in taste. An excellent charcoal grill.